Coffee and chocolate is calling my name! Who can relate? Satisfy both cravings in two bites of this incredibly delicious treat. (Or two cupcakes…) These two flavors are a brilliant pairing; very few people would disagree with that. We’ve made these for parties and work events and they get devoured fast. Absolutely irresistible! 2. Combine liquid ingredients: espresso, whole milk, and pure vanilla extract. Set aside until ready for use. 3. Preheat the oven to 350 degrees F. Line a standard-size muffin tin with paper liners. Sift dry ingredients: flour, cocoa powder, baking soda and salt. Mix with whisker until well combined. 4. Beat butter and both sugars together on a high speed until light and fluffy (about 3 minutes). Add the egg and beat again until combined. 5. Pour in the liquid mixture and mix for 10 seconds. Then add the dry mixture. On the lowest speed, mix everything together well for about a minute. (Do not over mix.) 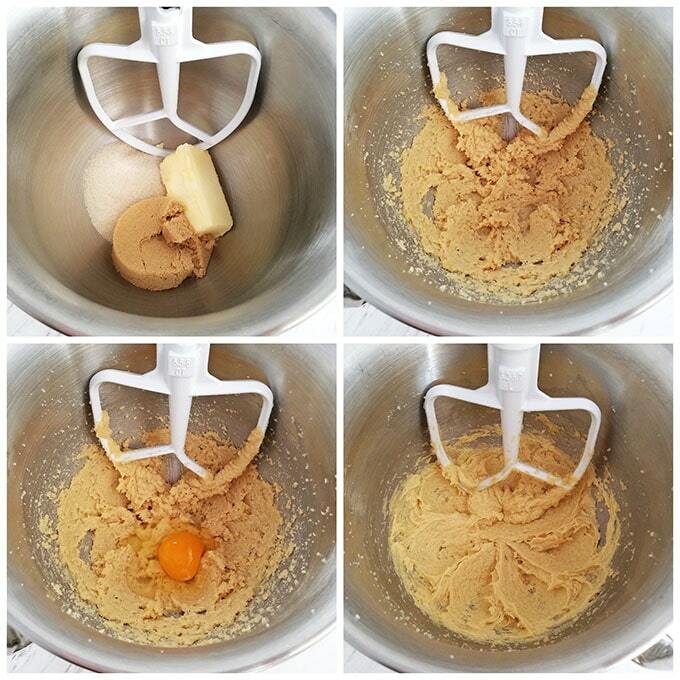 Scrape down the sides and bottom of the mixer bowl and mix again for 30 seconds. 6. Divide the batter evenly between the 12 liners. Bake for 18 minutes or until a toothpick, inserted in the center of a cupcake, comes out clean. Cool completely before frosting cupcakes. 1. 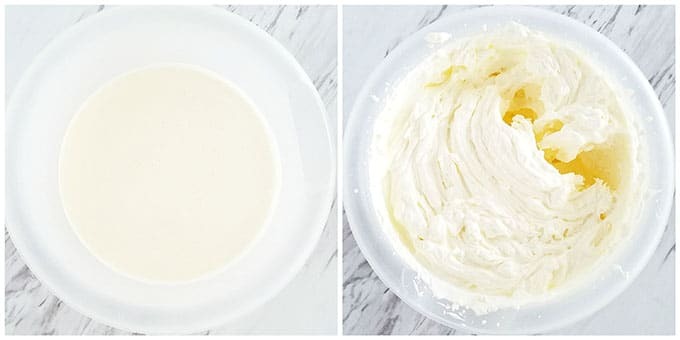 Beat softened cream cheese and organic sugar for 2 minutes. Let it sit on the mixer base for a couple of minutes (to allow the larger granules of organic sugar to melt). Beat again for 2 – 3 minutes. Remove the bowl from the mixer and set it aside. 3. 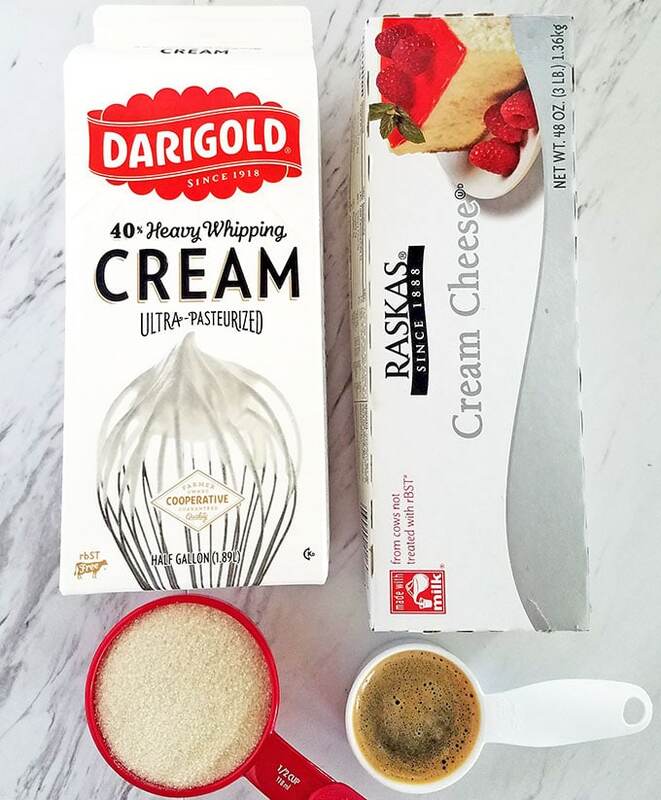 Add ½ of the beaten heavy cream to the cream cheese mixture and mix them with a silicon spatula. Then add the second half of the heavy cream and mix well again. Finally, add 1 tbsp. of cooled espresso and combine well. 4. 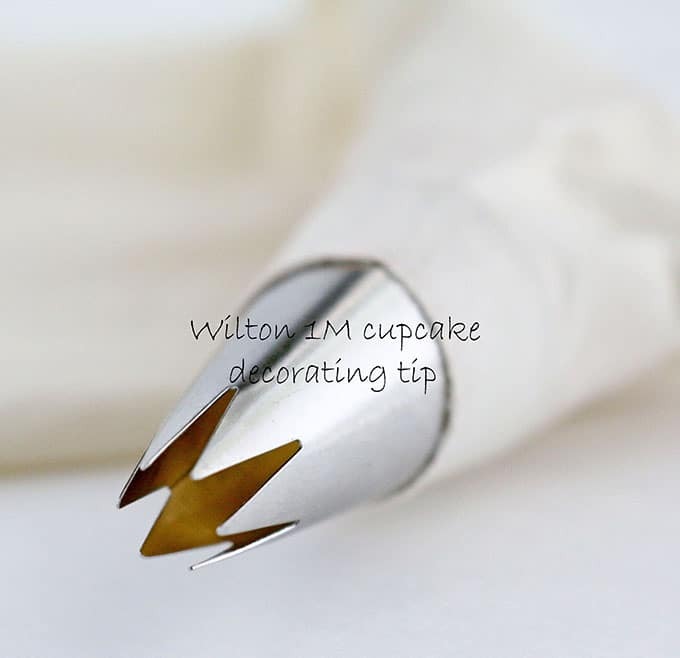 Use large 1M tip to pipe the cream onto cooled cupcakes. These two flavors are a brilliant pairing; very few people would disagree with that. We've made these for parties and work events and they get devoured fast. Absolutely unresistable! 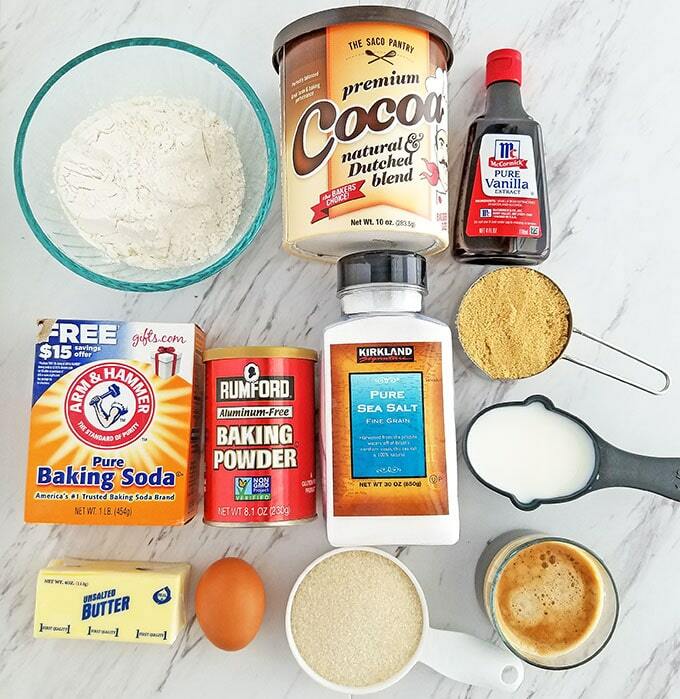 Combine liquid ingredients: espresso, whole milk, and pure vanilla extract. Set aside until ready for use. Preheat the oven to 350 degrees F. Line a standard-size muffin tin with paper liners. Sift dry ingredients: flour, cocoa powder, baking soda and salt. Mix with whisker until well combined. Beat butter and both sugars together on a high speed until light and fluffy (about 3 minutes). Add the egg and beat again until combined. Pour in the liquid mixture and mix for 10 seconds. Then add the dry mixture. On the lowest speed, mix everything together well for about a minute. (Do not over mix.) Scrape down the sides and bottom of the mixer bowl and mix again for 30 seconds. Divide the batter evenly between the 12 liners. 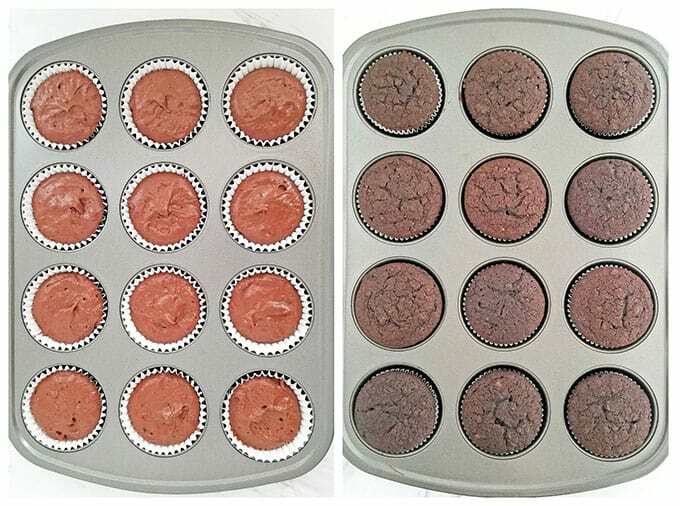 Bake for 18 minutes or until a toothpick, inserted in the center of a cupcake, comes out clean. Cool completely before frosting cupcakes. 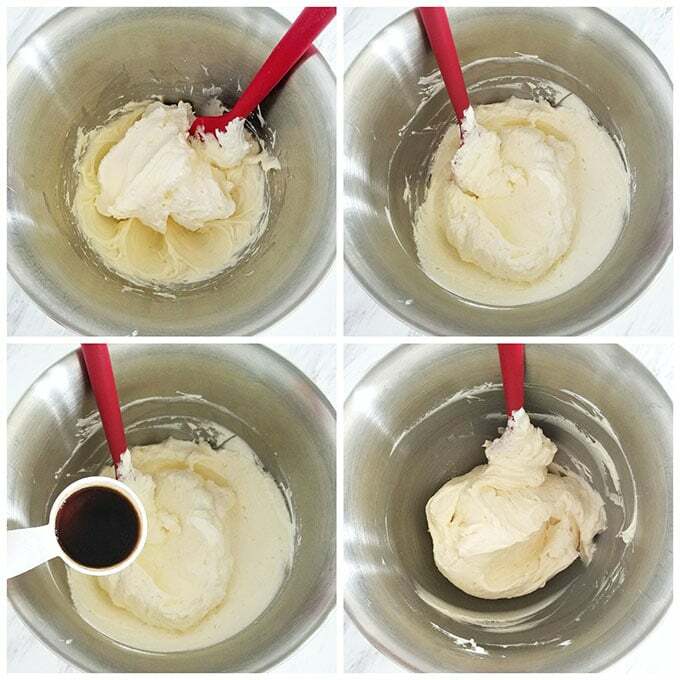 Beat softened cream cheese and organic sugar for 2 minutes. Let it sit on the mixer base for a couple of minutes (to allow the larger granules of organic sugar to melt). Beat again for 2 - 3 minutes. Remove the bowl from the mixer and set it aside. 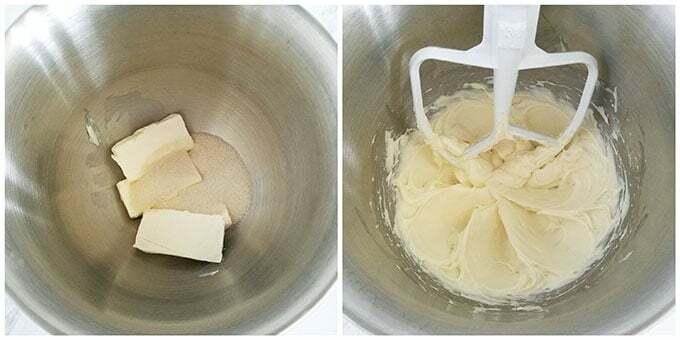 Add ½ of the beaten heavy cream to the cream cheese mixture and mix them with a silicon spatula. Then add the second half of the heavy cream and mix well again. Finally, add 1 tbsp. of cooled espresso and combine well. 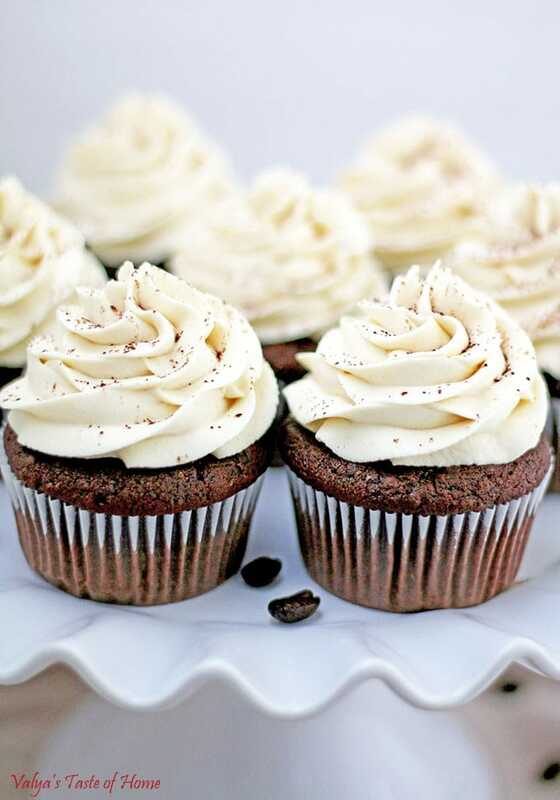 Use large 1M tip to pipe the cream onto cooled cupcakes. 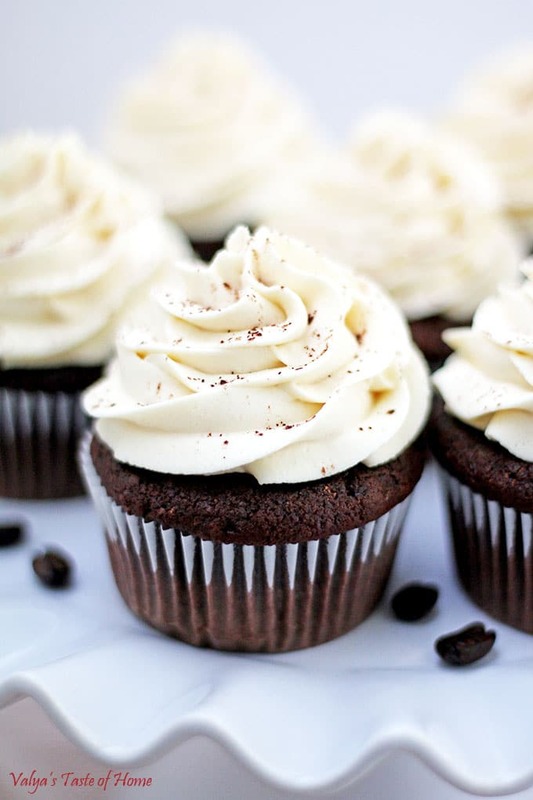 These cupcakes are totally calling my name also, they look so tasty. I had a few questions about it. Can I use brewed coffee or it will make a huge difference? Also, in the ingredients for milk, it says “¼ tsp. (1.25 g) – cup whole organic milk”…..was the word cup or tsp extra? Just wondering to put in the right measurements. P.S. 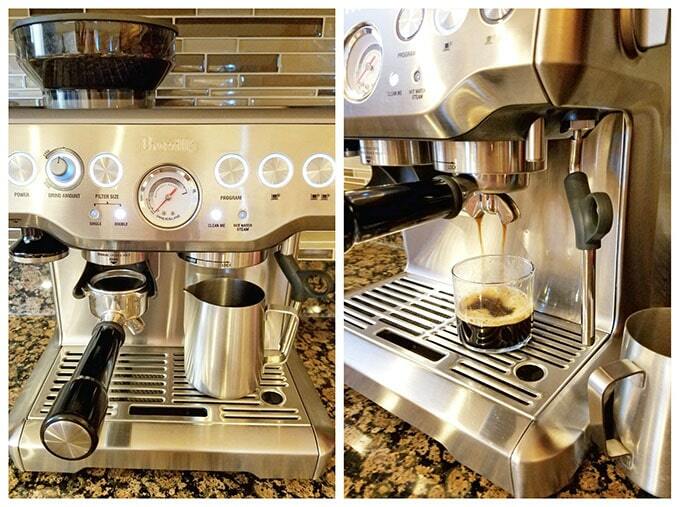 that’s a super nice espresso machines you’ve got! Good job in investing in it! 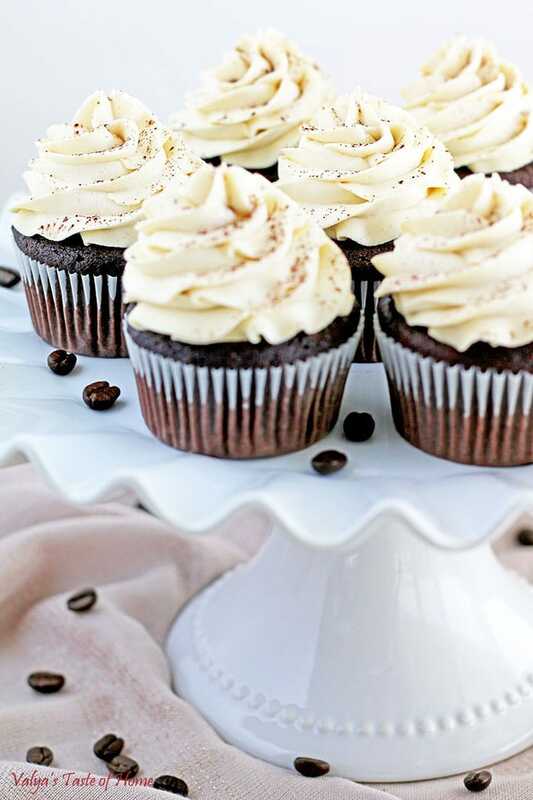 I’ve been craving mocha cupcakes and have been looking for a perfect recipe for a while now. These look so yummy. Can’t wait to try another recipe for yours!!! Thank you very much! I can’t wait to see a picture 🙂 and would appreciate hearing back how they turned out for you. I baked these cupcakes few days ago and they turned out sooo good! I wanted to ask you how can I convert this exact recipe into a cake? 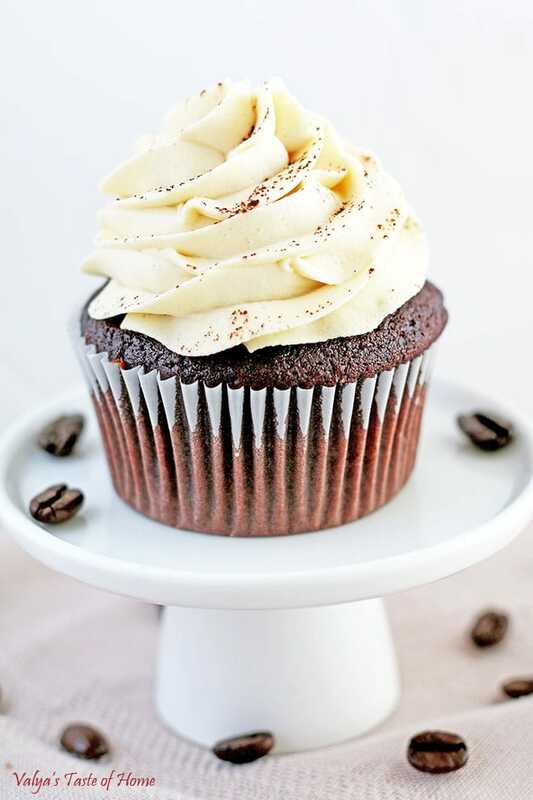 All chocolate cakes I’ve tried don’t satisfy “my chocolate cake dream” and after I made these cupcakes I literally imagined what an awesome chocolate, rich coffee taste like cake it could be! Please give me some of your professional advice! Thank you! Wow, what a great idea converting this recipe into a cake! I’m super excited to give it a try! ? This recipe is more likely for a smaller cake. I’m just predicting, because I have to make the recipe to be sure. I would devide batter in between 2 – 8″ spring pan’s. Bake it for 20 minutes. Cool. 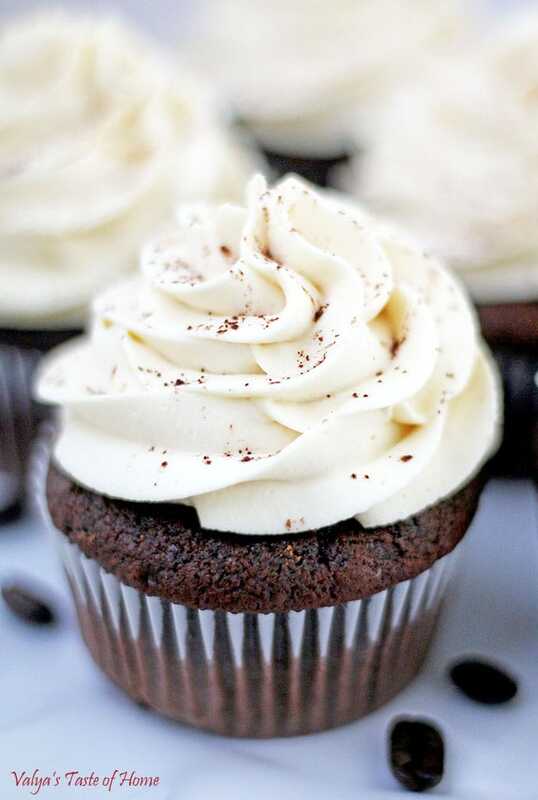 Frost it with the same amount of recipe cream as for cupcakes. I’ll update you once I make it. If I make mini cupcakes.. would baking time be the same? I would reduce baking time a bit. Check if they are done with a toothpick.